A recent interview with Authority Magazine writer Christine D. Warner explores advanced surgical techniques developed in response to the lack of innovation and expertise when it comes to minimally invasive GYN surgery. As an answer to this problem, I developed new approaches to minimally invasive GYN surgery by applying both known techniques performed in open surgery with new applications in laparoscopy to allow for a better way to perform hysterectomy, myomectomy, and other procedures to optimize outcomes for patients. These procedures had to be safe with much smaller incisions, with a procedural time that was much faster than the OBGYN approach, and resulted in better recovery times and lower cost. The procedures developed included DualPortGYN Hysterectomy and LAAM — Laparoscopic Assisted Abdominal Myomectomy. To schedule a consultation with a CIGC physician Dr. Natalya Danilyants or Dr. Paul MacKoul, call 888-SURGERY, or reach out online. Patient feedback is available in the Patient Spotlight section of our website, and on doctor review sites: Dr. Natalya Danilyants Reviews | Dr. Paul MacKoul Reviews. April is adenomyosis awareness month. One of the lesser known GYN conditions, adenomyosis, can cause severe pain and bleeding with the menstrual cycle. 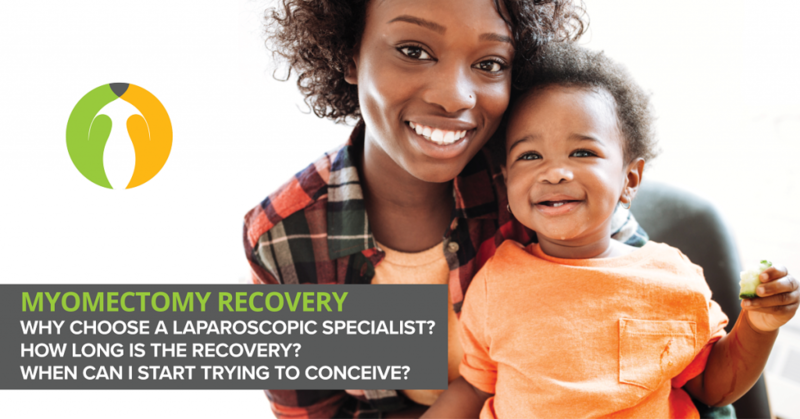 After attempts at conservative management with medicine and minor temporizing procedures, if the symptoms continue and a woman has completed child bearing, then hysterectomy can be an option. To date, hysterectomy is the only known cure for adenomyosis. 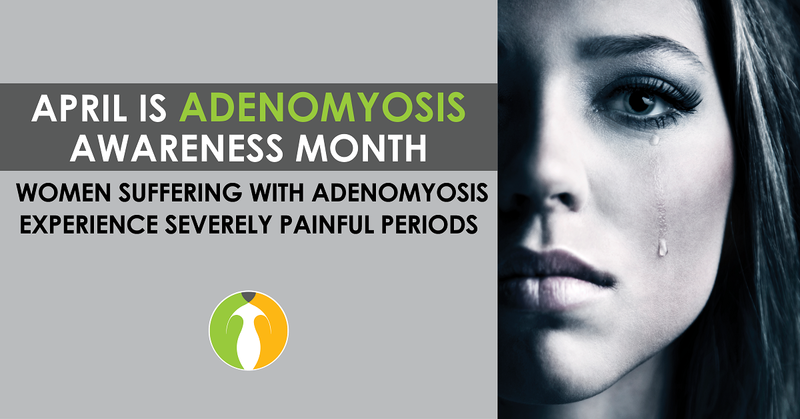 Additional information about the disease is available in the Adenomyosis section on the CIGC website, and in this recent blog: Extremely Painful Periods: Adenomyosis Awareness Month. Patient feedback is also available online, on doctor review sites: Dr. Natalya Danilyants Reviews | Dr. Paul MacKoul Reviews. To schedule a consultation with a CIGC physician, call 888-SURGERY or reach out online. Patients residing outside the Washington, DC area, can look into our travel program. Fibroids affect up to 80% of all women, and many struggle with symptoms for years before seeking surgical treatment. 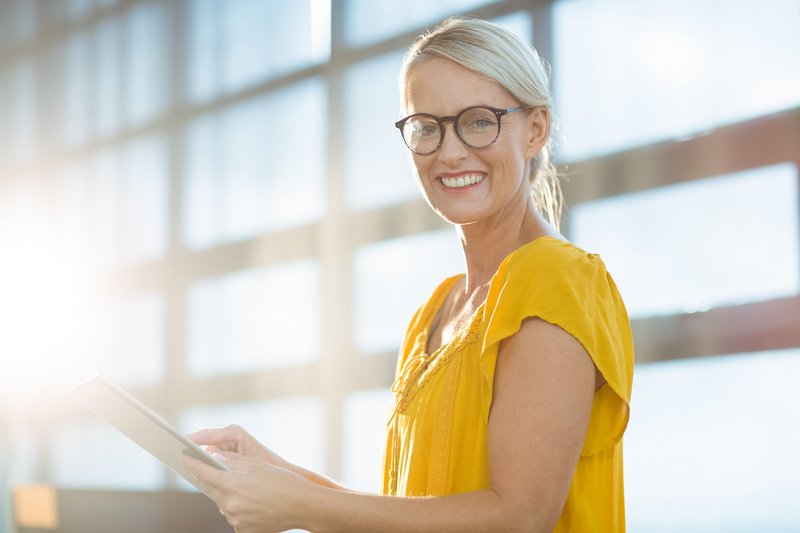 Minimally invasive removal of fibroids can relieve symptoms such as heavy menstrual bleeding and pelvic pain, and women get back to their normal lives in days vs weeks. Minimally invasive myomectomy is a fertility sparing procedure. At The Center for Innovative GYN Care, advanced surgical specialists use the LAAM technique to remove fibroids with 2 small incisions. The LAAM procedure is one of the least invasive and most thorough uterus sparing surgeries for fibroids, and it is only performed on patients who are able to retain fertility. When fertility is no longer a viable option (1% or less), and fibroid symptoms are severe, a myomectomy is not recommended. Hysterectomy is definitive treatment of fibroids and it is performed at CIGC with the DualPortGYN technique. Women generally recover in 1 week after DualPortGYN hysterectomy, and only two 5 mm incisions are used. A minimally invasive hysterectomy achieves permanent relief from symptoms, as opposed to myomectomy, where additional surgery may be necessary if fibroids recur. You can also find patient stories on doctor review sites: Dr. Natalya Danilyants Reviews | Dr. Paul MacKoul Reviews | Dr. Rupen Baxi Reviews. To schedule an appointment with a fibroid specialist Dr. Natalya Danilyants, Dr. Paul MacKoul or Dr. Rupen Baxi, call 888-SURGERY or reach out online. A myomectomy is a fertility-sparing procedure, designed to surgically remove fibroids. When fibroids become large, they can distort the uterus, making it harder for women to conceive and carry to term. Early treatment is important in order to prevent further issues, and seeking the help of a specialist is essential. Thorough removal of fibroids is possible for many patients. A myomectomy is not definitive treatment as fibroids can still return. The only definitive treatment is hysterectomy. A minimally invasive myomectomy relieves symptoms such as heavy menstrual bleeding, and prepares the uterus for pregnancy. With CIGC’s LAAM approach, laparoscopic myomectomy is performed using 2 small incisions. Women recover in less than 2 weeks and many are able to conceive naturally after surgery. In order to achieve a healthy pregnancy, women should wait at least 3 months after surgery before pursuing fertility options as it is essential for the uterus to be completely healed. CIGC patient feedback is also available online, on doctor review sites: Dr. Natalya Danilyants Reviews | Dr. Paul MacKoul Reviews | Dr. Rupen Baxi Reviews. To schedule a consultation with Dr. Natalya Danilyants, Dr. Paul MacKoul or Dr. Rupen Baxi, call 888-SURGERY or contact us online. Women residing outside the Washington DC area, looking for advanced options for GYN care, can read about CIGC’s travel program. The Center for Innovative GYN Care advanced surgical specialists use only minimally invasive techniques for fibroid removal. A laparoscopic approach in GYN surgery, with smaller and fewer incisions, helps patients recover faster and become mobile sooner. When you are limited in mobility for an extended period of time, more than two weeks, muscles begin to decondition, or detrain. Walking promotes the flow of oxygen throughout the body, and maintains normal breathing function. Gastrointestinal and urinary tract function are improved, and with improved blood flow, wounds heal faster. Every patient’s recovery is different and should be monitored by a physician, but gradual and measured increase in movement and activity can help prevent prolonged recovery times. At CIGC, Dr. Paul MacKoul, Dr. Natalya Danilyants and Dr. Rupen Baxi use the advanced LAAM technique for minimally invasive myomectomy and the DualPortGYN technique for minimally invasive hysterectomy. Both procedures use 2 small, cosmetically placed incisions, and women recover in less than 2 weeks. Learn about the importance of moving soon after fibroid surgery, and how advanced GYN techniques help patients avoid muscle detraining. Read this recent article from The Center for Innovative GYN Care and WTOP: Get Moving: Being Active Soon After Fibroid Removal Surgery Aids In Recovery. To book a consult with a CIGC physician, call 888-SURGERY or reach out online. Women have traveled from 46 US states and from 30 countries for CIGC’s innovative procedure. For patient feedback, visit our patient spotlight section or doctor review sites: Dr. Paul MacKoul Reviews | Dr. Natalya Danilyants Reviews | Dr. Rupen Baxi Reviews. CIGC’s advanced LAAM technique for laparoscopic fibroid removal provides such amazing results, many women choose to travel from out of state for surgery. With LAAM, our patients are able to recover faster, with less pain, and get back to work in less than 2 weeks. For many of them, the only options back home are more invasive open or robotic surgeries. 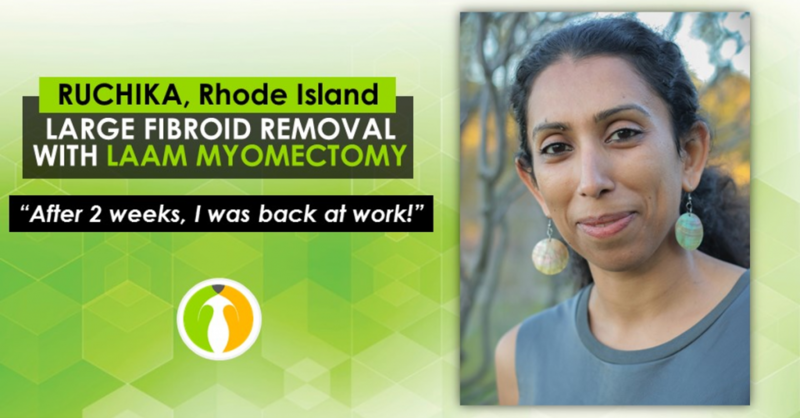 Ruchika S. from Rhode Island, had a very large fibroid, which did not cause any symptoms except making her stomach look big. She knew it had to be taken out. Ruchika researched her options and made the decision to travel for LAAM surgery. Ruchika thoroughly researched options for fibroid removal. She learned embolization wasn’t possible due to the size, and most medical professionals recommended open surgery as the only option. 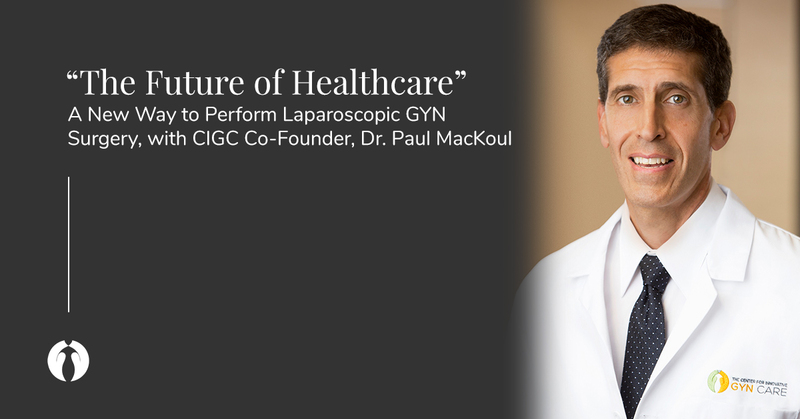 The advanced LAAM technique was developed by CIGC founders Natalya Danilyants MD and Paul MacKoul MD to provide superior surgical results, and get women back on their feet faster. LAAM is only performed on patients who are able to retain fertility and has no limit for fibroid size, number, or location. CIGC surgeons use only two small incisions for this approach, and recovery is less than 2 weeks. Ruchika’s fibroid was 1700 grams (close to 4 lbs). A normal uterus is 70 grams. Due to the size, most surgeons are only able to perform an open procedure, with 6-8 weeks recovery time. With LAAM, minimally invasive removal of a fibroid this size is possible. When it comes to complex GYN conditions, it’s important to seek specialty care. CIGC specialists are focused 100% on improving surgical outcomes with advanced minimally invasive GYN surgery. To discuss your options with a fibroid specialist Dr. Natalya Danilyants, Dr. Paul MacKoul or Dr. Rupen Baxi, call 888-SURGERY or contact us online. Hear from our patients in our patient stoplight section or on doctor review sites: Dr. Natalya Danilyants Reviews | Dr. Paul MacKoul Reviews | Dr. Rupen Baxi Reviews. When it comes to a fibroid removal procedure, the surgical approach plays a great role in the patient’s recovery. The ability to perform thorough removal with smaller and fewer incisions leads to less complications and post-operative pain. Placement of incisions through the midline of the abdomen, bypassing the lateral abdominal muscles, allows for a safer surgery and a faster recovery. CIGC surgeons developed the LAAM technique for myomectomy and the DualPortGYN approach for hysterectomy as definitive fibroid removal, to improve surgical outcomes. The use of the smallest incisions possible, including ultra-minilaparotomy, provides remarkable surgical results. “Ultra-minilaparotomy is considered to be cosmetically superior as the incision is made along the natural cleavage of the skin folds. It is made in the midline and is very small, therefore, sparing the nerves and blood vessels on the lateral edges of the abdomen. It combines the best advantages of open and laparoscopic techniques.” said CIGC’s Rupen Baxi MD. CIGC patient and Maryland-based OBGYN, Dr. Valinda Nwadike, chose to undergo DualPortGYN hysterectomy as definitive fibroid treatment. Three days after her surgery, she was delivering babies. “Dr. Natalya Danilyants advised me to take it easy for a week. The next day my son had a doctor’s appointment at 4PM and I felt well enough to sit with him in the waiting room, and then I went to dinner. Three days after the surgery, I was scheduled to work a 24 hour shift at the hospital, and delivered three babies. I was a little tired, but it didn’t slow me down. The next day, my husband and I drove to North Carolina. My husband drove, and I felt fine during the ride. I was told not to run for a couple of weeks, but I was fine doing boot camp a week later. I didn’t need any narcotics, I didn’t have any bleeding.” Dr. Nwadike said. Her full story is available here. Lindsay (33) chose to travel from Dallas, TX for advanced laparoscopic myomectomy with the LAAM technique. She went through extensive research to find the option with the best possible outcome. “My surgery was on a Thursday and I just flew in the day before. I didn’t know what to expect, I thought I was going to be in crazy pain at least for the weekend. But the next day, I woke up, and I felt great. We actually went site-seeing. That was amazing, the day after surgery I was up and moving. I used pain killers for about 3 nights. By the day I got back to Dallas, I was off painkillers. There wasn’t really pain, I just felt sore. It was completely different than I expected.” Lindsay said. You can read her story here. A minimally invasive approach to fibroid removal is in the patient’s best interest. 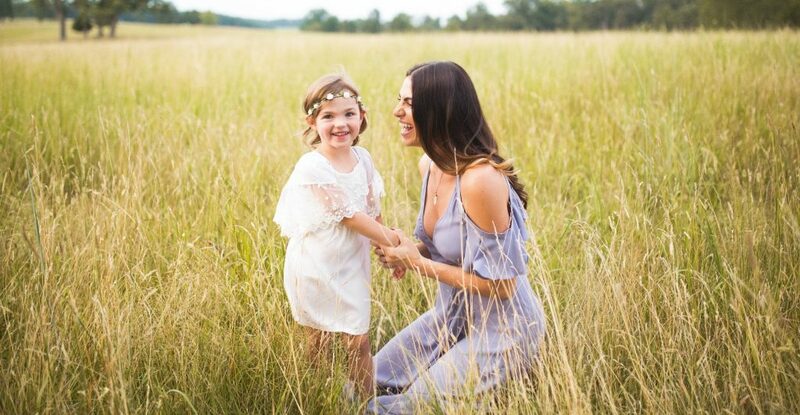 Many women residing outside the DC area choose to travel to CIGC for advanced GYN surgery as these procedures allow them to recover faster and to get back to their lives sooner. Patients recover in less than 2 weeks after LAAM myomectomy and within 1 week after DualPortGYN hysterectomy. 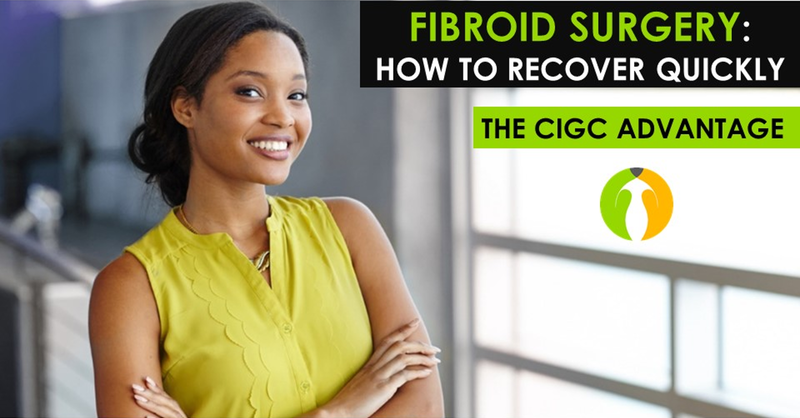 To schedule a consult and talk about your options for fibroid treatment, call CIGC at 888-SURGERY or reach out online. CIGC physicians Rupen Baxi MD, Natalya Danilyants MD and Paul MacKoul MD focus 100% on advanced laparoscopic GYN surgery. More patient feedback is available online, on doctor review sites: Dr. Natalya Danilyants Reviews | Dr. Paul MacKoul Reviews | Dr. Rupen Baxi Reviews. Brittany (30) from Herndon, Virginia had been trying to conceive for four years before coming to CIGC for minimally invasive cyst removal. During surgery, it was discovered she had also been suffering from endometriosis and bowel adhesions. Endometriosis is known to cause infertility as endometrial tissue can affect the ovaries and quality of eggs, and can create toxicity in the lining. After GYN surgery, Brittany got pregnant within a month. “My daughter is 3 years old now. She is happy, healthy and perfect. It brings tears to my eyes just thinking about the carefulness of the surgery, and being able to keep my ovary and returning to normal within days. I didn’t think that I would end up keeping my ovary and didn’t know if I could ever get pregnant on my own. When that test came back positive my world changed all for the better.” Brittany said. CIGC surgeons use the advanced DualPortGYN technique to perform procedures like cyst removal, endometriosis excision, hysterectomy a.o. The approach is minimally invasive, with only two 5 mm incisions and 1 week recovery time. You can read additional patient feedback on our website in the patient spotlight section, or online on doctor review sites: Dr. Natalya Danilyants Reviews | Dr. Paul MacKoul Reviews | Dr. Rupen Baxi Reviews. To book a consult with a CIGC physician, call 888-SURGERY or contact us online. Endometriosis affects millions of women, and for many it takes years to get diagnosed. The primary symptom of endometriosis is intense pelvic pain with the menstrual cycle, which can be constant, or it can progress. Women who suffer with severe symptoms every month have a hard time at home, work or school, and they are often seen as unreliable. It can become difficult to explain to teachers or bosses why you repeatedly need time off for a few days each month. Endometriosis pain is often confused with regular menstrual cramping and symptoms are dismissed in doctor’s offices. The longer it takes to get a diagnosis & treatment, the more damage can occur. Endometriosis causes inflammation and scarring which primarily affects the pelvis, but lesions can spread to other areas of the body. It takes an experienced specialist to recognize the signs and to deliver a proper diagnosis. Thorough excision of all instances of endometriosis is essential to alleviate symptoms and achieve long-term relief. It is fueled by estrogen. It primarily creates lesions within the pelvic cavity, but has also been found in other areas of the body like the abdominal cavity, the lungs and the brain. Endometriosis can be deep within the tissue and it can affect nerves. Lesions must be thoroughly removed through excision to alleviate symptoms. Endometriosis can cause pelvic adhesions and cysts to develop. Why some women develop endometriosis and others do not is a mystery. That makes it harder for general medical practitioners to diagnose the condition early, which is important in order to minimize the damage to the reproductive system. Endometriosis specialists have a more complete understanding of the disease, the symptoms, and the damage it can cause. Endometriosis excision removes the instances of endometriosis. Deep removal of affected tissue is required in order to eliminate the potential for regrowth and to achieve long-term relief. If resection of endometriosis is not thorough or it is performed incorrectly, surgery can actually make the condition worse. At CIGC, minimally invasive resection of endometriosis is performed using the DualPortGYN approach. The DualPortGYN approach was developed by CIGC minimally invasive GYN surgeons Natalya Danilyants MD and Paul MacKoul MD and it uses just two 5 MM incisions. The surgeon who operates is able to see the entire pelvic cavity in order to achieve thorough removal so all instances of endometriosis are removed. The incisions are located in the midline of the abdomen and pelvis, avoiding the muscles, which reduces post-operative pain. Women go home the same day and are usually back to work within 1 week after DualPortGYN surgery. Call 888-SURGERY or contact us online to schedule an appointment with an endometriosis specialist at CIGC. Women who reside outside the Washington DC area travel to CIGC for GYN surgery: learn about our travel program. You can read about our patients’ experience on our website here or on doctor review websites: Dr. Natalya Danilyants Reviews | Dr. Paul MacKoul Reviews | Dr. Rupen Baxi Reviews.